An inviting & safe street for our community??? Anyone here in Dunwoody use "Next Door" for posting & responding to community topics? Someone has proposed adding a third lane on Mt. Vernon & making it "reversible" -- like on Roswell Rd / Hwy-9 in Roswell just north of the Chattahoochee river. - Trip origins & destinations: Do we know where these people are coming from and headed to? How far are they going? -- Single occupancy vehicles: How many of these vehicles only have one person in them? -- Alternative mode: Is there ANY OTHER WAY they could move around other than in their motor vehicle? (Bicycle, or course. Maybe even walking) What prohibits them? -- Cost: Where does the money come from if we were to do this? Acquire right of way -- most likely requiring eminent domain. Moving utilities, stormwater, etc., would run into many millions of dollars. Right now for repaving alone, cars only pay for roughly 18%. So that huge expansion would represent an even greater subsidy. -- Livability: Does a third lane help our community maintain our "sense of place"? Does it help people who are merely just passing through to SLOW DOWN and drive the SPEED LIMIT? Do passersby sense that they have ARRIVED in a place where children, families and retirees are out & about, walking, biking, and safely enjoying our neighborhoods? -- TWO HOURS A DAY, 5 days a week: That's 520 hours out of 8,760 in a year that traffic is backed up. For the other 8,240 the current street configuration is fine enough. -- CAPACITY BUILDING: When you plan for cars & traffic, you get cars & traffic. Add capacity, and you simply get more traffic. In the long run, you will NEVER reduce traffic. 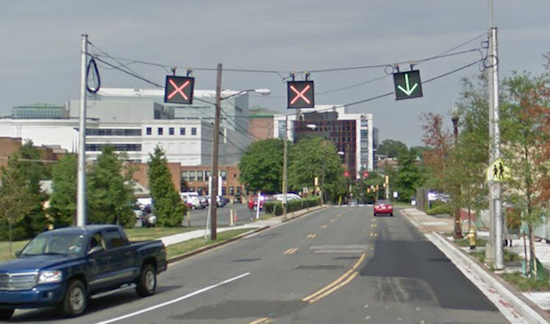 We're going to selectively add some turn lanes at key intersections at Vermack / Manhasset and Tilly Mill. Adding a reversible lane -- or even a continuous center turn lane -- will only make this street less safe. Go look at one in person and ask yourself if you'd like to live on a street with one. It ruins the residential feel of Dunwoody.